Let’s face it, cleaning your windows is a job you’d rather forget about. It’s annoying and time-consuming. Fast forward to the 21st century and there’s a new kid on the block. Drop your watered down vinegar and your bit of kitchen towel and pick up your battery powered window vacuum cleaner instead. Window vacs have been built to remove the fine dirt and dust from your window using any window cleaning spray, resulting in a streak-free finish. They're also great for removing condensation from windows. So what do you need to look out for when you’re buying your window vacuum cleaner? First, the run time. While a window vacuum cleaner with an average 35 minute charge time may be perfectly fine for whipping your way around a bungalow in one go, or indeed cleaning your car windows, those with a three-storey townhouse will need to accept that multiple charges will be required. Second, you’ll need to consider the shape of the head – has it been optimised to get into the tightest grooves of the window frame or is an additional head required to get into these nooks and crannies? Finally, the price. Think about how often you’re going to use your window vacuum cleaner and whether it’s worth splashing the cash for one that won’t cop out on you halfway through a cleaning mission. We think the best window vac currently on the market is the Karcher WV5 Premium 2nd Generation. Read on for our full rundown. They say you get what you pay for and with this top range model vacuum cleaner, you get a lot. Karcher has designed the product with efficiency in mind – so users get quick cleaning and drying of flat surfaces. 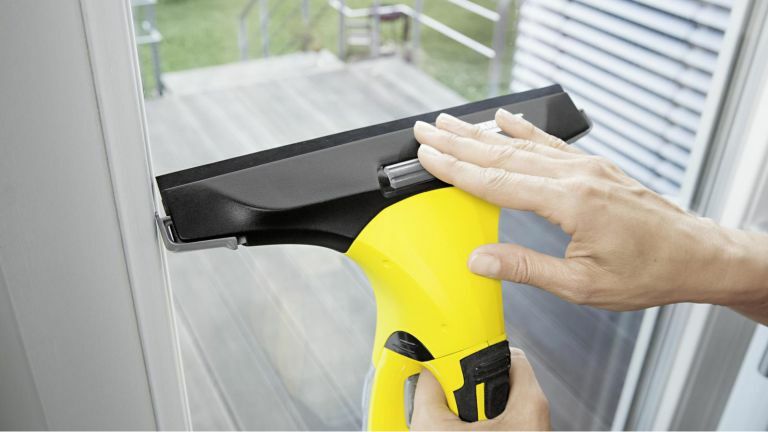 Karcher promises a streak-free, drip-free finish when used with its own branded cleaning products, although reviewers say any window cleaner will do. In addition to the product itself, you get a spray bottle, a micro-fibre head to remove stubborn dirt and a 170mm suction nozzle for getting right into those edges. The only negative seems to be the heaviness of the unit, with some reviewers mentioning it makes their arm ache after long periods of use. Leifheit has optimised this window vac so it removes water and condensation from windows well. It promises 360 degree non-leak manoeuvrability, which means skylights aren’t a problem for it either. Working alongside a decent window cleaner, Leifheit says the gadget should provide a streak-free finish, although reviewers say the the hoover head that it comes with struggles to get right into the edges. While cheaper than the Karcher at the top of our list, the accessories for this window vacuum must be paid for as an extra. Accessories include Leifheit’s click-system telescopic handles, which are perfect for reaching conservatory roofs. While 10% shorter and lighter, the smaller sibling of the WV5 should still do a good job of doing what Karcher promises: a streak free finish. The best thing about this version is its ability to fit into places the the bigger one can’t – for example glass panels on doors or walls. sAlthough the running time is 10 minutes less than the WV5, the charging time is significantly less, which means you should be able to work your way around a multi-story building without too much fuss. The positive comments echo across both products, but to get the streak-free finish that Karcher promise, it seems like your technique has to be right. If you’re looking for a window vacuum cleaner that’s lightweight as well as powerful, this one ought to fit the bill. Offering up a 30 minute battery life, it’s not the longest runner in the list but enough time to clean a fair amount of windows. Minky boasts that the quick and powerful motor also hoovers up condensation and steam, storing it in the 150ml storage tank, which is larger than both Karcher products. While cheaper than the Karcher models, the accessories included with the hoover are limited, with a spray bottle, polishing cloth and just one head in the box. Despite the low price, this window vacuum cleaner offers up 25 minutes of power and promises to deliver a streak-free finish. Reviewers commend the value for money the device offers , making it a great alternative to more expensive window vacuum cleaners. Its tank size is 300ml, which leaves plenty of room for storing siphoned water, although reviewers mention that it starts to leak once the volume reaches a certain level. Included with the device is a spray bottle and a microfibre pad. With only one head included, you may find it struggles to get into tighter spaces. There are better performing window vacuum cleaners on the market but if you’re after one which is small, compact and easy to store, the Vileda WindoMatic is worth taking a look at. As with all the manufacturers in this list, Vileda promises a streak-free finish when used for cleaning and a good amount of suction power when used for siphoning up moisture. The battery life of the product is 20 minutes, which isn’t bad but not the best, and the charge time isn’t the quickest, either. On the upside, the vac has a large 300ml tank, which makes it great if you have a condensation problem in your home in the winter. The device also comes with a microfibre pad to rub off persistent dirt and a spray bottle for your cleaning liquid.